A four hour taxi ride from Dalhousie, near Adam’s Peak had us arriving in Kandy. Visions of a town made up of confectionary were soon dashed upon entering the hustle and bustle of the city centre in the height and heat of the midday sun. Kandy is the original and now spiritual capital of Sri Lanka. Situated at the entry to the highlands as you come from Colombo, Kandy usually houses travellers for a few days to get their temple fix before heading further into the hills. A decent sized and decent looking man-made lake fills the valley that Kandy is situated in. Apart from adding some aesthetic appeal it causes quite a traffic jam on either side as tuk-tuks battle with trucks and buses to squeeze through the narrow and lawless intersections at each end. Our accommodation was the Kandy Backpackers Hostel at the opposite end of the lake to the town. Not to be mistaken with the Kandy City Hostel which had better signage and was immediately across the road! Our error at walking into the wrong hostel had us envious as the Kandy City Hostel had the modern look of a travellers respite and a cute chocolate labrador in residence. Conversely, The Kandy Hostel, (unsignposted, down an alley off the main road) was more a 2-star Motel 6. Although it had a pool! It did look like all the money had gone into the pool and then none was left over to finish the hostel. Despite that the staff were friendly and chilled out and seemed to take pride in the place even if it was a bit bare essentials. Did I mention the pool had disco lights! 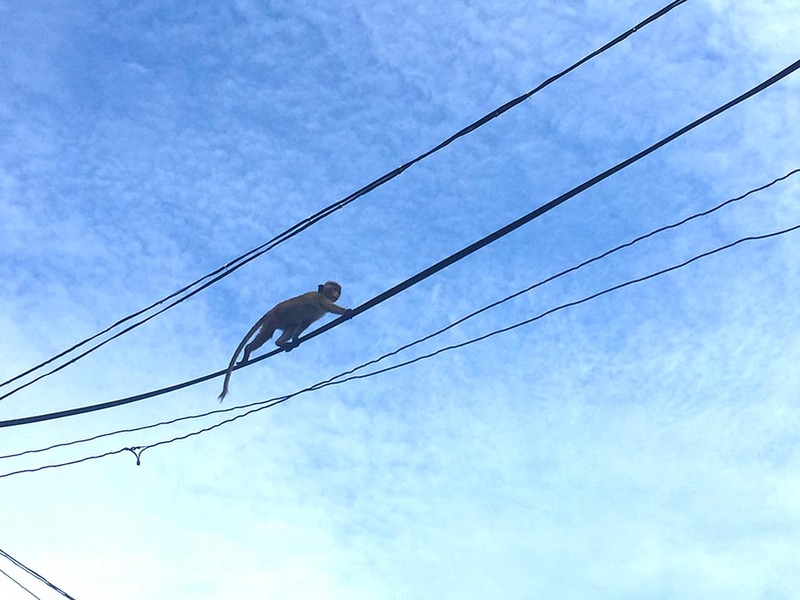 With monkeys swinging through the trees, mongoose terrorising the chickens in the pen and bird calls echoing against the sound of construction workers, the surroundings were a buzz with a myriad of activity. Having risen at 3am, hiked for 4 hours up Adams’s peak and travelled 3 hours by car we were in the mood for a brief siesta by the pool. So we were glad for the investment! Later in the evening we tuk-tuk’d into town. Kandy, being a spiritual town, it follows that it is dry, meaning little to no alcohol served, nor much life in the city after sun down. Being a former British colony we reconnoitred an aptly named Royal Bar which was previously an administrative building. A very elegant courtyard and balcony from which to enjoy a cold Lion beer. Lion beers are typically served in 750ml bottles which we now realised after ordering two! Next day, the final one of 2016, had us exploring the outskirts of town. 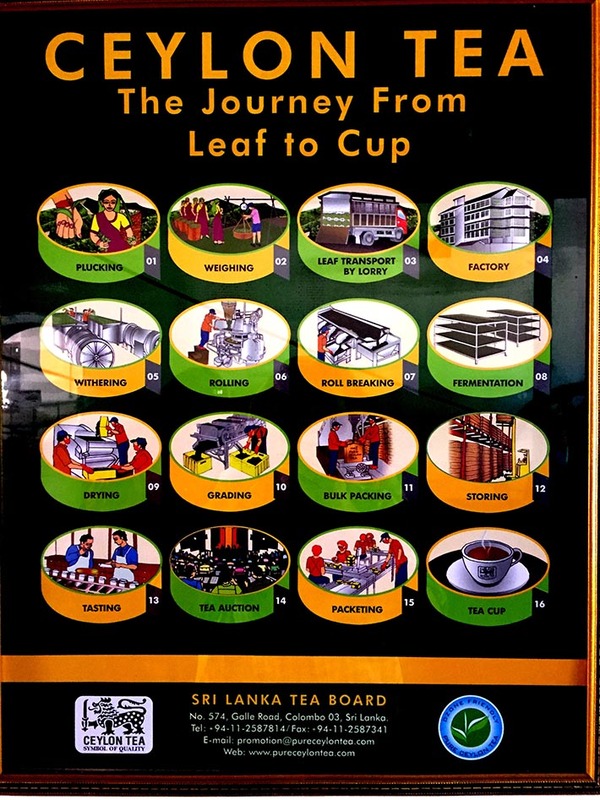 We headed out to the Ceylon Tea museum which was a fascinating recreation of how tea was first made. One large motor powering all other machines through an elaborate conveyor belt system. It also had wood burning and hydro power to compliment. While not a working tea factory now it had a model display to illustrate the machines at work. Of course the tour is finished off with a cup of one of Sri Lanka’s finest. Tuk-tuk back to town and into a local restaurant after our more western breakfast option seemed a bit sterile, it was time to get amongst it. We sampled some very tasty local fare at the Muslim Restaurant. Rotti apparently not for midday consumption so we went with a Kabul. Very tasty and very filling! Decided to walk back to our ‘room with a pool’ along the lake to walk off the food. Street stalls selling mostly lottery tickets. In fact they are being sold everywhere! A very cynical view but lotteries are simply a tax on hope. It seemed sad that this was a viable option to spend hard earned money on. We ventured up a windy side road en route to check out Helga’s Folley. An eccentric hotel perched on a clifftop overlooking Kandy. 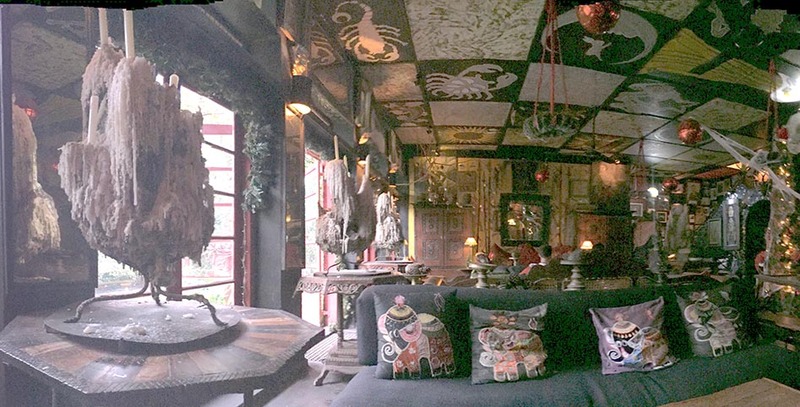 With a very bohemian decor, Helga’s Folley looked like it’s permanently set to be used in a halloween movie. A small kitty taking it’s liking to Erin as we sat on a low couch enjoying a drink. But it was New Year’s Eve! Only one viable alternative in this very Buddhist centric town. Apart from the Royal Hotel, The Bamboo house was the other ex-pat British pub in town, pleasantly located on a hill overlooking the city and lake. It was crammed with diners (all tourists) and had a ‘nightclub’ kicking off at 9pm for $30 per man (ladies free!). After sharing a table with a nice german couple for dinner and hearing a table of Koreans countdown New Year for downtown Seoul, we opted for the early exit and tuk-tuk’d our way home and in bed well before 2017 arrived in Sri Lanka.